As a business owner you often find yourself in the position where you have to do everything. It is a lot of responsibility to run a business and to find the appropriate people to help you. You have to handle lot of sensitive information, but at the same time, you have to get things done. To get someone to update your eBay listings, first of all you have to give them your logins. With eBay logins your employees have access to your items, orders and payment methods too. This can be risky, as a simple mistake from one of your employees can cost you dearly. We have finally made it easier for you, though. In order to avoid having your employees go to parts of eBay they are not supposed to go to, we have added limited access users to Ad-Lister. This allows you to have a separate user account for your employees, who would then create or update your e-Commerce products for you. These users will have limited access to the complex pages of Ad-Lister. No need to give them your eBay logins anymore. No need to worry about them taking the wrong actions. There are 2 new roles we have created and which can be assigned to users: product editor and product manager. 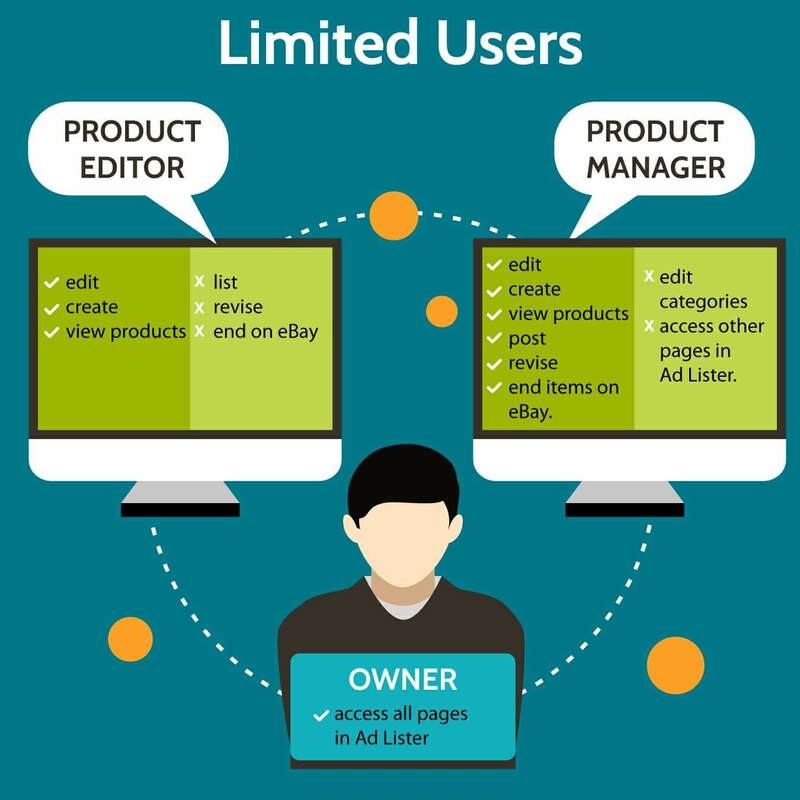 The product editor can create, view and edit products. They can also delete items that are not currently listed on eBay. They do not have access to manage categories on eBay or custom pages. Also, they cannot list, revise or end any of your listings on eBay either. The product manager, on the other hand, is able to do all of the above, plus they can also list, revise or end items on eBay or delete products. In addition to the above, you will still have your normal Ad-Lister user, with full access to all the pages and details on your account. Now you can make sure your employees can help with updating your listings, while your only job will be to oversee them, without having to do any of their work. If you need more information or want to try this new feature out, please feel free to call our support helpline on 0121 285 1052.